The genuine issues get lost in an unhealthy lean towards white supremacy, encouraged by this fixation with insisting we all revere western civilisation. Any criticism is unpatriotic. It’s become like some sort of cheerleading exercise – we are here to lead the rest, always prove that west is best. The same has happened with action on climate change. It has been stymied by the threats of a few politicians to withdraw their loyalty to any leader who even mentions emissions reduction. Anyone who mentions science is a greenie leftard warmist who spends their days at inner-city cafes eating smashed avo and drinking lattes. 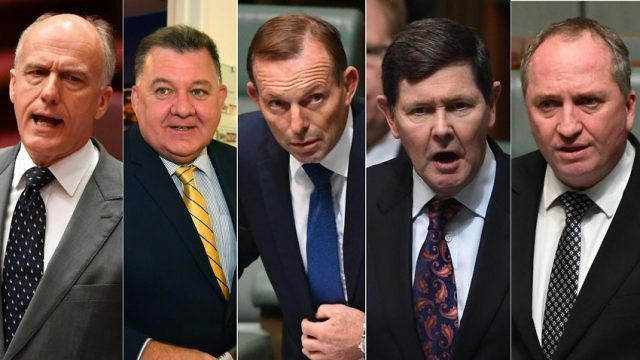 These few have been actively courted and bombarded with misinformation from the Minerals Council, the IPA and other lobby groups and media determined to squeeze one last payday out of their coal assets or denialist propaganda. With pretty much every expert, every agency, every organisation, every stakeholder, and every financier saying renewable energy will reduce the price of electricity, our government seems determined to guarantee the profits of anyone who will build coal-fired power. While they crow about the surge in coal prices, they seem to forget that that makes coal-fired power even less competitive. But hey, joining the dots isn’t big with the extreme right. In trying to remove discrimination in marriage laws, and promote respectful relationships and acceptance of diversity by providing teachers with resources to use in schools, we have unleashed the extreme right religious lobby who are fighting hard to entrench their discrimination and undo any idea that society actually accepts people for who they are. The success of these fringe-dwellers in frightening politicians has made everyone realise that sensible discussion ain’t gonna happen – loud threats work better and it’s dog eat dog in trying to shout the loudest. View the education funding jostling. It remains to be seen how far Labor will go in courting votes by trying to appease the wrong people but one thing is certain – until we remove the Coalition from office, any chance to progress sensible decision-making will be stopped by the Monash Forum and the Monkey Pod boys. Sensible discussion? Sooooo last century. … JOURNALIST: Prime Minister, you’re on the bus tour. Why are you flying? If the bus wasn’t to attract media attention or to allow Morrison to stop off in small towns, what was it for? Are we being charged for the bus and the planes? The real difficulty, as I see it, is getting any kind of sensible discussion within the ordinary electorate. So many people with fixed ideas based on little, or totally incorrect, information expounding their views on every topic under the sun and becoming belligerent and aggressive when their opinons are questioned. It is a deep malaise of society. Labor will take a tax sledgehammer to our economy. I guess the Libs prefer to nuke our economy. It’s a mobile billboard, Kaye. I suspect that it will be another of his failed advertising campaigns. Must be now about almost ten years ago when on ABC’s Unleashed the right-wingers, the anti-asylum seeker mob, used to shout: they take OUR jobs, OUR houses….and to my great surprise: OUR WOMEN…. As part of my research (or some form of masochistic self-flagellation), I have been observing and commenting on Craig Kelly’s facebook page. The misinformation from a member of parliament is extraordinary. He will link to an article about an actual scientific report and then completely misrepresent what the report says and even what the article says. No-one seems to click on the links to read for themselves. When I pull him up on it, which I have done countless times, I am abused by people who just react to Craig’s ridiculous lies without reading – one guy told me I don’t get satire???? If only it WAS satire. DrakeN: Our civilisation has developed science and technology to a level that is too high for us to manage. That is why you get ignorant people insisting they know what they are talking about. There is no way they could ever learn enough about any topic, so they swallow whatever spin is put out by the mass-media. They will tell you that coal-fired power is required for “baseload power”, but they can’t tell you what “baseload power” is. I have a sneaking suspicion even Angus Taylor can’t tell us, but then no one has ever asked him. Apparently we pay for the charter flight and accommodation, Libs pay the bus and driver. If it’s not campaigning, why are the Libs paying for it? “About half a doz. staffers usually accompany snotty — two spinners, a policy adviser (probably his holy lump of coal), executive officer and security. The overnight travelling allowance for senior staff varies depending on location. For Brisbane $358 per night, while in Mackay it is $293. he thought he might as well give it a go – nothing else has worked. We’ve got a hide lecturing anyone about political camps shrouded in secrecy. No doubt to the charming little ditty Ride of the Valkyries as the motormouth motors on. Must have been why he picked up those Broncos cheerleaders, with a lowly placed source suggesting downer will reprise his role as a desiccated drag queen, complete with the fishnet stockings and high heels. An even lower sauce refused to confirm that snotty wants to pack the bus with some spare coal, just in case. My low sauces in high places suggested that asbestos Joolz will meet up with the cavalcade, fulfilling the role of makeup and stylist, with baarnaby, during a night on the piss, penning an aria with the working title, Whisky and coal and wild wild women, to be performed at as yet unnamed local school. Is the PM for real. Must think we are all stupid. David Stokes – yes, he does think we are all stupid. In the field of psychology, the Dunning–Kruger effect is a cognitive bias in which people of low ability have illusory superiority and mistakenly assess their cognitive ability as greater than it is.) Morrison ( I refuse to use the nickname – just too chummy) is a textbook example of DK. I think you mean it’s a mobile dillboard or dorkboad or dickheadboard. Or all three. Kaye Lee: Fair dinkum power! Thank you! How could I forget? They quickly changed the buzz-word so that no one can ask what it actually means. Remember what Humpty Dumpty said to Alice! Angus Taylor is now on an unassailable wicket. He’s going for fair dinkum power and the power companies will deliver it, by Jove, or else! Eventhough I tick the “Notify me of follow up comments by email” box, I never receive them. I receive the “Notify me of new posts” posts. If only they had come up with a more exciting buzz-word it might have worked. You reckon? Hee, hee! This from a gubmint that keeps people locked up offshore in wire enclosed camps? The absolute gall of Scummo and his cronies. Great article Dave, you brought together nicely some of the crucial issues that are not being discussed in an intelligent manner. Pity though, that even on here people seem more interested in buses and who pays what. I think this falls right in the Scummo Tour of Trash category. On the Beefy’s Farcebook page, I posted this comment below after choking on my coffee while seeing the delightfully repugnant spectacle of Scummo stuffing his fat head with pies. What do the Brains Trust think? Harsh or No? So, what do the Brains Trust think? Do these stupid photo ops do any good for the politicians involved, or do they harm the business that get sucked into the vortex of idiocy? Geoff, that’s a glitch with WordPress. We have to wait until they fix it, which hopefully they will do soon. Let us know if it persists. MP Craig Kelly, has gone over to the dark-side with Sky after dark announcing that he will take over from Ross Cameron on the conservative froth & bubble program the Outsiders. Kelly, who is currently the sitting member for Hughes in Sydney’s south faces a serious pre-selection challenge, has confirmed he has a “verbal agreement” to co-host Outsiders with commentator Rowan Dean once a week. Seems to me that Kelly will now almost certainly lose his pre-selection in Hughes where he is not popular and he is evidently setting up his post politics career as a right-wing shock jock. Obviously jobs at Sky are not dished out on merit ! I haven’t been able to receive follow up comments for some years : would be nice if they could fix that glitch ! The wind howls and the skies weep at the news of the passing of Ted Mack. Ted passed quietly on Tuesday after a long struggle with cancer. He was a man of true principles who constantly strived for greater political transparency and accountability, and notably eschewed all the opportunity for lurks, perks, graft and grift that come with elected office. May his light remain a beacon for others to follow. Ave atque vale Ted Mack. Indeed, corvus boreus and helvityni, it is disturbingly incongruous that respects be paid to Mr Mack in an article titled “The hysterical fringes have stopped sensible debate”. In my ignorance of his notable achievements and deep convictions, the following excerpts were of much interest. As always, the media latch onto common titles which all but ignore substantial contribution to this thing we call democracy. Their constant reference to him as the ‘Father of Independents’ portrays his contribution as a relevance to a political system and ignore his steadfast conviction that the constituents came first. Had the media ever recognised this, they would likely have referred to him as the ‘Father of Independence’. “Mack was elected to North Sydney council in 1974 and became mayor in 1980. He promptly sold the mayoral Mercedes and bought community buses with the proceeds. It is deeply ironic that, had Mr Mack not retired from federal politics due to his objection to excessive parliamentary allowances, one of the most duplicitous grifter’s to ever enter politics, Hockey, would not have stood a chance. The reforms he introduced to council appear to have been rescinded and eroded over time. Their site still shows an invitation for constituent participation. The constitutional reform of 2012 led to a reduction of councillors and, on the ‘no’ side, it notes that councillors will be expected to work more, which will inhibit their capacity to exercise due diligence and explore new options. This resulted in the ‘Community Forums’ being suspended. Not due to lack of interest, but due to lack of capacity! Having been unfamiliar with Mr Mack’s story, thank you corvus boreus and helvityni for the reference. For those who think the majority of us are disinterested or disinclined to become involved, here is yet another example of how hungry we are for a genuine opportunity. We are getting closer and closer to democracy and the likes of Mr Mack reminds us of what is in the offing. So, back we go to discussing hysterical fringes. Admirers of Ted Mack should read this speech he gave in 2013. It provides much food for thought today. These nongs that call themselves conservatives are nothing of the sort, they are a pack off regressive minded twats that would take us back two hundred years. Special report: Tony Abbott and conservative MPs campaign to take back control of Liberal party. Ho, ho! I’m not sure whether to laugh or cry or both! Four years ago! It is like we are using the ‘repair manual’ for a 1950’s produced vehicle to attempt repair of the latest overseas manufactured luxury vehicle, such is the discrepancy. To completely abuse the analogy, we stopped making vehicles rather than update the manual. Up until this morning, and with deep gratitude to corvus boreus and helvityni, I’d been largely ignorant of Mr Mack. What a treasure today has been. It’s a tad odd that a media outlet, a party to ‘the system’, is now becoming an advocate of transparency and accountability as the only effective measures of ‘the system’. It hasn’t had much traction yet, given the disemboweling of the ABC, the sale of Fairfax, and the rise of ‘Lachlan of NewsCorpse’. Or that political parties, by their silent approbation, have become signatories to their own ‘death warrants’. Reform will come. Yes there were some good and intelligent people in power and there remain a few. So what? Populist fascism tied to unfettered capitalism lurks here and in many other societies. The bus is just one of many cheap tactics of a marketing man with a limited intelligence. The problem is democracy? poor education and shackled media? What to do?